Following on from Bart’s talk at Tridion Developer Summit 2016 on DXA in the cloud, I thought that looks cool, let me give that a try. The steps to create a DXA instance are pretty simple. Get started from this link, by clicking the “Create Web App” link. That’s it! 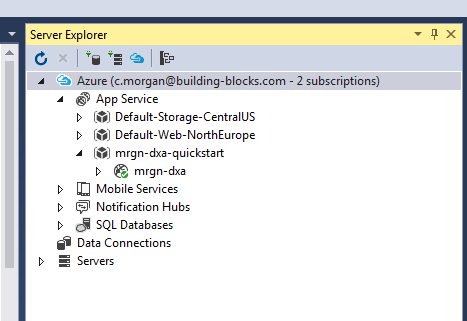 In about 5 minutes you’ll have a working DXA instance running on the Azure Cloud. You can see mine here: http://mrgn-dxa.azurewebsites.net. Note: I created my server in the West US data-center. The SDL Web infrastructure configured OOTB is located in Northern Europe. You’ll get better performance having the DXA instance close to the SDL Web infrastructure. Thanks to the introduction of CIL (Content Interaction Library) and CDaaS (Content Delivery as a Service) in SDL Web 8, DXA is able to run in a FREE Azure Website. This is because the SDL Web integration is now entirely via a micro-services (hosted elsewhere). DXA, with SDL Web 8, can be a 100% standard ASP.NET (or Java) MVC application, and therefore it can easily run in the free tier on Azure. Note: Currently this is not setup for the Java version. We expect a similar “quick start” for Java in the future, likely using Amazon AWS. 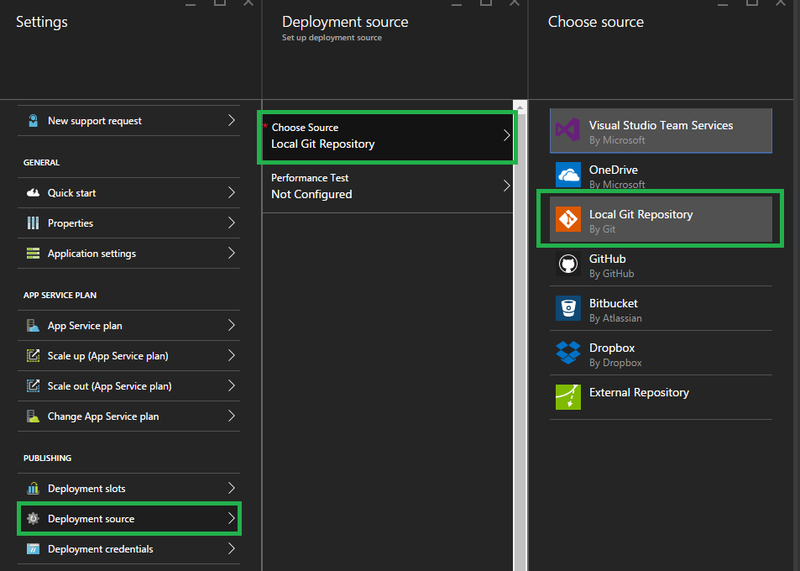 In Server Explorer window expand the Azure node. From here you can explore all the files deployed, including logs files, configuration files etc.. If you want to point the solution to your own SDL Web instance, all you need to do is update the web.config as shown below. 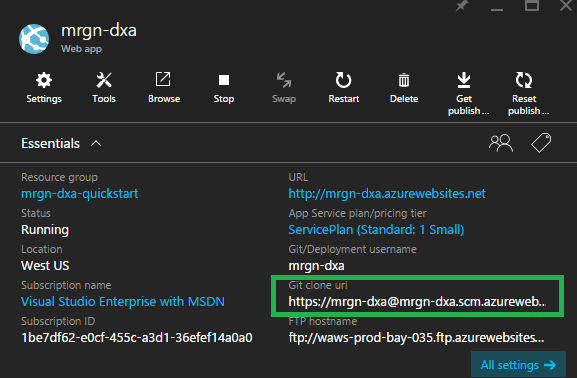 <!-- After Azure Web Gallery deployment, your DXA Web Application is connected to a read-only SDL Web 8 CIS environment provisioned by SDL. Note: DXA must be installed, configured and published on the Content Manager side before you will see anything if you point to your own SDL Web instance. Hopefully this helps map out the steps to accompany the great video by Bart.